Exergy Development Group, GE, Atlantic Power, Reunion Power, and Fagen Inc. all worked together to build Idaho's largest wind farm, the 183 MW Idaho Wind Project, a project that was divided into 11 different sites in two different regions. The Idaho Wind Project is the state's largest wind farm to date—122 turbines stretching across 10,000 acres of farmland—and was truly a team effort. The 183 megawatt project creates enough energy to power 39,700 homes and is the result of a collaboration between Exergy Development Group, GE Energy Financial Services, Atlantic Power, Reunion Power, and contractor Fagen Inc. The wind farm is located in two different areas—Burley and Hagerman—with 70 miles between. The122 GE 1.5 MW turbines are split between 11 sites in southern Idaho (three around the town of Burley and eight around the town of Hagerman), which gives grid operators more flexibility and makes the sites more efficient. Due to Idaho state regulations regarding the size of renewable energy projects, each of the 11 sites has a separate agreement with utility Idaho Power. The $500 million project came in on time and on budget and was ready for its operational phase by the end of 2010, with Reunion Power taking over as general manager. Like all large-scale projects, the real time was spent planning, permitting, and educating. "We've been developing this project for five years," says Dustin Shively, energy systems engineer for Exergy. "Our company believes in an integrated approach. We started by going out and literally knocking on people's doors, talking to the landowners, and forming those relationships. "The relationship with the utility was formed along the way," he adds, "but part of that was already in place through previous projects." There was also all the necessary permitting on the county level, the environmental permitting, and other regulatory mandates to be met. The company took its time to make sure the entire project worked—both from a financial standpoint and what was best for the surrounding communities. For example, the eight projects near Hagerman are on a plateau, and the Snake River is several hundred feet below. Because the canyon wall is full of bird activity and nesting areas, setbacks were required. Once they were set, Exergy literally went the extra distance, going back twice as far as the setbacks required. "We are very sensitive to environmental issues and do very thorough assessments," explains Shively. "We make every effort to look at the landscape and place our turbines to maximize their efficiency and respect the surrounding environment. When someone says ‘Don't go past this line,' we find it irresponsible to go right up to that line and push it to the limit." Pushing that limit inevitably leads to strained relations. "Exergy's approach of doing what should be done is one of the reasons I work for them," he added, on a personal note. "It's not a matter of just how quickly can you get it up, sell it, and move on." 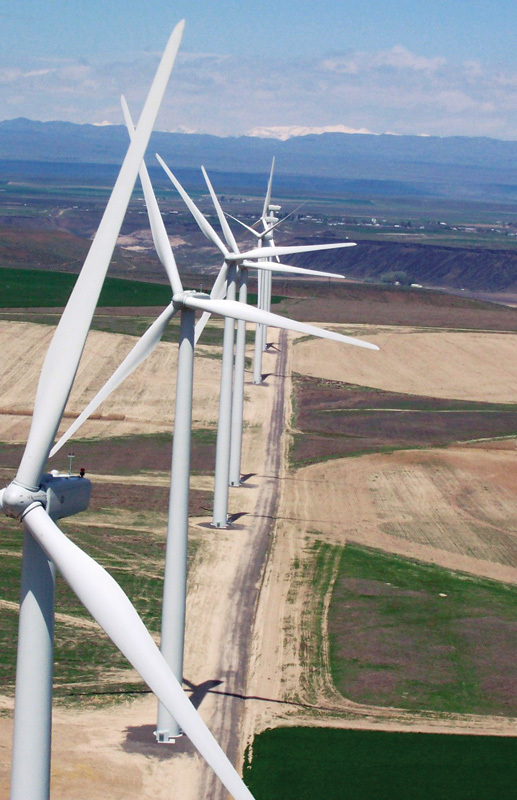 The location of the Idaho Wind Project was chosen because it met all the criteria—necessary wind speeds, good distribution and frequency of wind speed, and good connection. "Transmission is a factor that really stops a lot of sites that may be a good wind resource," says Shively. "If it's too far away or the transmission is too congested, you're not able to interconnect. That's one of the primary reasons some of the Northern Midwest states, like the Dakotas or Eastern Montana, aren't full of wind turbines. It's not the resource—it's the transmission." As mentioned before, Idaho Wind Project is an umbrella for 11 projects. "Each project is independent with individual land leases, interconnection agreements, and power off-take agreements. But for purposes of financing and economies of scale, it worked to make them a consolidated presentation," says Shively. "It's unique," he adds. "I don't ever remember seeing this kind of layout, but it just comes down to how we can get these projects online efficiently. This turned out to be the optimal methodology for moving the projects forward." Creating partners of the landowners was also a big piece of the preparation. Shively says it was simply educating everyone about wind energy. "I'd go out and sit down with people and talk to them. We would get questions like, ‘Are these turbines going to interfere with my farming or ranching operations?' But before I sat down and talked to them, they didn't know the answer." Education and finding solutions for the landowners was ongoing throughout the planning process. Shively and his team talked to people at public meetings and listened to all their concerns. For example, some farmers were worried that the turbine towers would interfere with their irrigation pivots. Those pivots went into Exergy's mapping. "If we had the flexibility to avoid the pivots and farming operations, we absolutely did," says Shively. 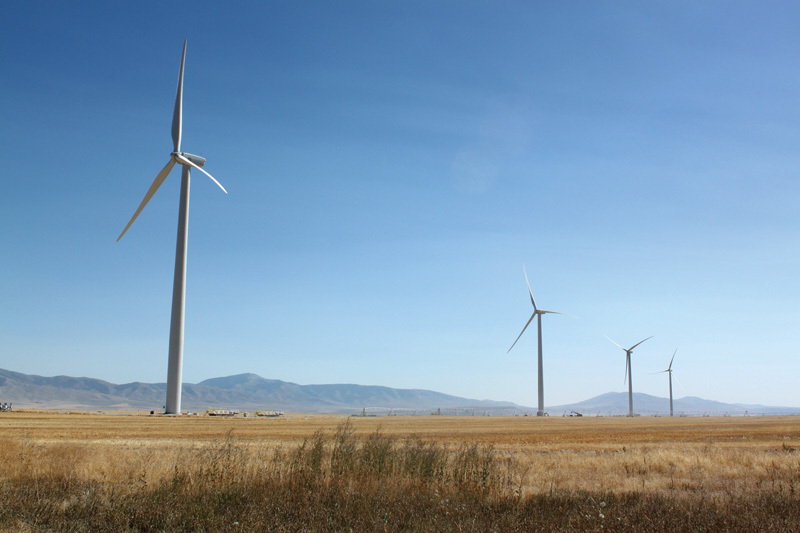 Fagen Inc., the Engineering, Procurement, and Construction contractor and project manager of the Idaho Wind Project, was able to get the turbines up quickly—they installed 122 GE 1.5 MW turbines in 111 calendar days. The farmers also had a lot of issues about roads, worried that the land would be torn up or unusable. Exergy was clear with them from the start that there would be roads between the turbines. During construction, the road had to be wide enough to handle the crane pads, but afterwards they would be narrowed to 12 or 16 feet. In some cases, the farmers welcomed the addition of roads on their land. "It's pretty rural country, and now they have vehicle access to parts of it that they didn't before," says Shively. "But from the get-go, we anticipate a siting process that incorporates landowner feedback." Overall, he says it's easy for a company like Exergy because part of their ethos is to work with the community. The one-on-one time with the landowners put them at ease and allowed them to be involved, instead of just being a spectator. Throughout it all, Exergy and GE Financial Services kept up a great working relationship. "GE is a big company and very organized and disciplined in the way that they do things. That's good because you have to have all your ducks in a row, especially when it's a $500 million project," says Shively. When it came time to physically install the 122 GE 1.5 MW turbines, there were new challenges to deal with—including an unforeseen fire. Reid Jurgenson of Fagen Inc., Engineering, Procurement, and Construction contractor and project manager of the Idaho Wind Project, says several days before his team installed the turbines, a lightning storm set off a fire that burned hundreds of thousands of acres. The Idaho Project was in the center of the blaze. "We watered around the cranes and luckily nothing burned," says Jurgenson. The obstacles hardly slowed the Fagen team. When it was time to install the turbines, they did it in record time—122 turbines in 111 calendar days. This was an incredible accomplishment. Particularly because of the distances between the turbine sites. Even though the Fagen crew had the towers for the turbines in place, it was still a 2.5-hour drive between Hagerman and Burley. Once at Burley, the three sites were three to four miles apart. "The Hagerman site alone is five miles wide and about 17 miles long," says Jurgenson. "The crew moved large cranes from area to area, and we put the turbines up as we went," says Jurgenson. "We'd get as many as six to eight turbines a day completed, provided there was no wind blowing." Construction of the project provided a major economic boost to the local economy. "As part of our approach, Exergy is committed to hiring local contractors whenever possible," says Shively. "This project was a great economic stimulus to rural Idaho. It created over 300 construction jobs (only 175 were projected) and 25 permanent jobs for operations over the life of the project." Exergy is already looking ahead to its next projects. They have over 4,000 megawatts in development, and some of those new projects will be springing up in Montana, Wyoming, and southern Minnesota. "We have very far-reaching goals, but they are definitely attainable," says Shively. "Our new technology division is advancing a new turbine design and other innovative energy technologies. We're also moving projects forward in solar, hydro, anaerobic digestion, and biomass." Exergy is a pretty dynamic, busy company these days, he notes. "We have a really good team. We all work in parallel and come together when we need to. "I'm excited to be part of a company that is going about renewable energy in a responsible way," he added.